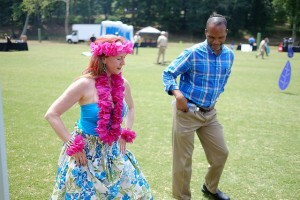 Approximately 800 staff members walked, shuttled and drove to the Luau by the Falls staff appreciation event held June 24 at Waterfall Field next to Reynolda Village. 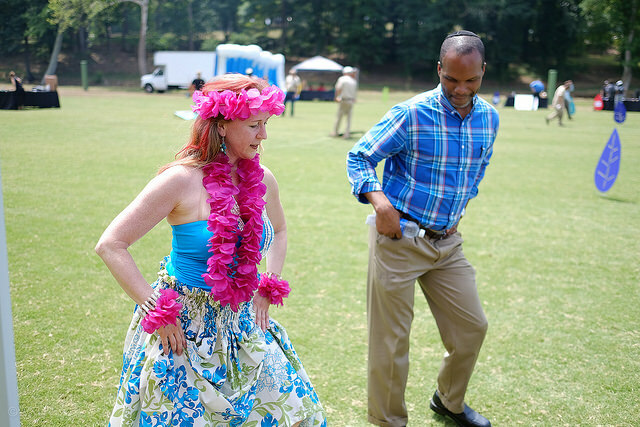 Organized by the Staff Advisory Council (SAC) and Thrive, the luau offered staff an opportunity to enjoy lunch, lawn games, a performance by hula dancers, Hawaiian music, free massages, balloon sculptures and much more. While the SAC held a similar event last year, this was the first time that Thrive had an opportunity to partner in an SAC event to express appreciation for all that the University’s staff do year round to serve the University. Launched in 2014, Thrive is the University’s transformative new approach to wellbeing. Equal parts education and inspiration, the campus-wide initiative is led by the new Office of Wellbeing. Much of the activities and programming for the luau were intended to illustrate the eight dimensions of wellbeing that are key components of the Thrive initiative. Those dimensions include intellectual, physical, environmental, spiritual, emotional, occupational, social and financial. For lunch, staff members were offered pineapple barbecue chicken, grilled hamburgers and veggie burgers, sausage dogs, tropical coleslaw, salad, and a variety of desserts, including ice cream. During lunch, a group of hula dancers entertained in the big tent where lunch was served. The staff event, like last year, also succeeded in collecting canned food donations for the Second Harvest Food Bank of Northwest North Carolina. Already, the SAC and Thrive are looking toward planning for next summer’s staff appreciation event, taking notes on what staff most appreciated about it and collecting ideas on new additions for next year. See Ken Bennett’s photos of the event here.